Ascension symptoms are a hot topic lately… So what are they? Essentially, Ascension Symptoms are features or experiences said to be caused by the ascension process. As you move through the great shift that is ascension, changes will be happening on all levels of your being. Through the process of spiritual awakening and ascension, your vibrational frequency is becoming lighter, your conscious awareness is expanding and your thoughts, emotions, and beliefs are changing. And that’s not it, in addition to the energetic and spiritual changes, your physical body is shifting to allow you to hold increased levels of light. As you move through the ascension process changes will happen at the level of mind, body, spirit, and emotion. There is incredible beauty, grace, and wellness offered through the new energies… But as the old and outdated falls and fades away it does not always go willingly. The path of least resistance is the way through symptoms and challenges. Let go and allow the changes of ascension to flow through your life. However, as the very fabric and foundation of reality is altered for those on an ascension path, there is sometimes resistance, destabilization, and ascension symptoms that can occur. Ascension symptoms are not a direct result of the higher energies of light, but rather they are a result of holding onto limitations and resistance in the mind and body. But what about when you do go to the doctor and they cannot seem to find anything wrong with you? This is the case for many people now…. This readjustment phase is where the bulk of challenging ascension symptoms occur as your physical body must release the old energy so it too can get up to speed. 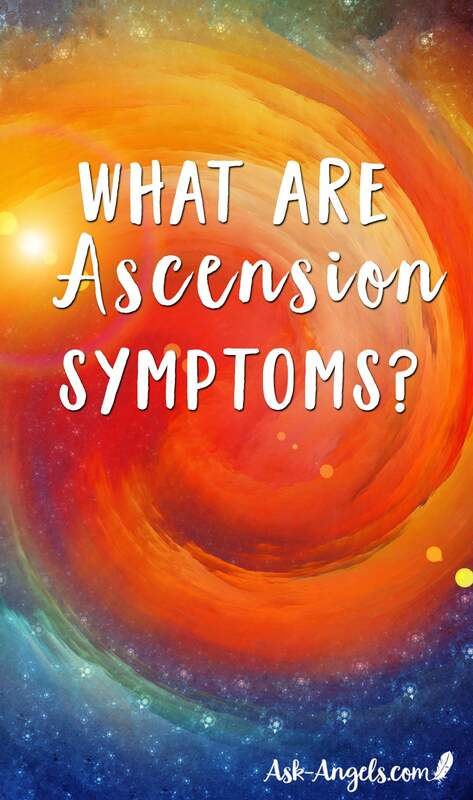 I try not to focus too much on the challenges, but since I have gotten several questions on this topic I do want to cover a few of the most common ascension symptoms people are experiencing. I hope that this will bring you some peace of mind. I wrote an entire article on getting through ascension symptoms that you can access here. But in a nut shell… Relax, go with the flow, reconnect with nature, meditate and breathe your way through any ascension symptoms you may be experiencing. Are you feeling achy-ness, or pain in areas of your body that you have not overexerted, or maybe discomfort in an area of your physical body but you don’t know why? Physical discomfort and pain are key indicators that something is energetically out of balance. When you start shifting energetically, the places in your physical body, which are still holding onto density, will definitely let you know. Achy legs, neck pain, and shoulder tension are common places for dense energy and stress to be stored. If you practice Reiki, or you have learned Angel Energy Healing, flow healing light into these areas to disperse blockages. When the energetic block is released, you may feel an immediate shift. When headaches appear as an ascension symptom, it is usually a result of the energies of others being in your head. Though it can also be a response to your third eye and crown chakra opening and expanding to a new level. Cutting the cords of attachment with others is a great place to start, as is practicing psychic protection, and mindfulness. Imagine a white rose of light surrounding your entire head, dissolving any negativity, lower vibrational thoughts, and tension to help ease headaches. Lavender essential oil, and meditation are additional tools that can help you to release headaches, especially those which are a result of ascension. As you open to higher levels of light and spiritual energy, you may begin to feel it flowing through your physical being like electricity. You may feel tingling at the top of your head, or in your hands as Divine light flows in and around you. This might even cause a sensation of vertigo or dizziness as your light body is activated, and you expand into new levels of multidimensional awareness. Many ascending people also begin to feel when and where they have a blockage, and then when it is released they are able to feel the light flowing in and replenishing the physical, mental, or spiritual being. This may also cause you to feel a bit funny, ungrounded, spacey and even physically disoriented at times. Breathe, relax, allow the energy to flow, and you will adjust to it. Time spent outdoors in nature will also help you to ground and integrate your new levels of light. When you find your energy quickly shifting from joy to sadness, without knowing why it’s highly likely that the emotions you’re experiencing in that moment aren’t really yours! As you further awaken on the ascension path it is likely that your sensitivity will increase too. Feeling the emotions of others is known as being empathic. You can learn some tips for coping as an empath here. You may also find yourself re-living your own past painful experiences, with pain, and sadness tied to past times and even lives. When these dense emotions come up… Face them. Feel them. Cry if you feel like it, and then let the emotion go. Emotions are powerful outlets for release… Hand your negative thoughts, worries, frustrations, and challenging emotions over to the angels and into the light. Don’t worry about why old feeling are coming up now… Trust that you’re releasing. Breathe, face and feel the emotion, and then when you’re ready, let it go. The truth of you authentic nature is that you are a high vibrational spiritual being… A part of you remembers full fullness, grace and brilliance of your spiritual light. As you have spiritual experiences now, which are contrasted by the dense and challenging physical environment you still reside within, you may get a strong yearning to go home. You may wish you could just stay in the realms of spirit and let go of all the density and drama which comes with being physical. To help you through this… Start to look for signs of the new earth and high vibrational living that is in the process of coming into being. Notice what is beautiful, graceful and kind in the world. What in the physical is reminiscent of your true home in spirit? Appreciate the little moments and bits of the physical that are good, vibrant, and beautiful and you will not only draw more of these things into the physical… Through this you are also helping to tip the scale for mass consciousness towards the fifth dimension and as you continue to evolve you can be a wayshower for others. Spend some time in nature, just being present in the moment in awe and gratitude for the beauty around you. Do you find you keep waking up at 3 AM, 2:22, 4:24 or some other unusual time? More on Angels and Numbers here! A great deal of spiritual and healing work happens while you are sleeping… Sometimes waking up is just the ‘breather’ you need to integrate whatever work was happening during your sleep. If you do find you wake up and can’t fall back asleep you may want to get up for a while… Write in your journal, draw, or go outside and look at the stars. When this happens to me, I will sometimes just stay in bed, but put on a guided meditation or take advantage of the peace and quiet to pray, focus on my intentions, or do some spiritual clearing, or angel energy healing work. You may also just feel like sleeping more, or less! Do your best to honor this, and if you feel like you need more sleep, get to bed early, sleep in on the weekend, or treat yourself to a Sunday afternoon nap. You may wake up and remember you were slaying monsters, being chased, fighting in a war or just about anything is possible in the dream state. Through intense dream work you are often releasing old energy, as well as reconnecting with past life experiences, knowledge and memories. If you do wake up to a scary dream… Call in your angels to surround you and release any and all fear based energy into the light. I ask my angels to help me release past life challenges and old energy through my dreams in a gentle and loving way… This has really helped! Also, keep in mind that your angels, and the power of love and light are infinitely more powerful than any darkness or negativity. If you need to, get up and light a candle as a symbol of the light you’re calling in to release anything which is not love. As you continue to ascend and change… So may many of your relationships. You may find old friendships fading away, or changing in their form and function. You may simply not be available to engage in old patterns of manipulation and energy struggle with people, and when you stop these patterns, the relationship may very well fall away. If you feel like you’re losing friends… Don’t worry. Let go and go with the flow, asking the angels to help you align with your true soul friends and soul family who will support you in living in more joy and love as you continue further on your path. Before new friendships come in you may go through a period of feeling lonely… or like it’s challenging for you to relate to other people. Fill any void you feel within with the love and light of the Divine and of Christ consciousness and know that when things do fall away from your life they are making way for something new. Increased sensitivity is a common ascension symptom… As you become more spiritually sensitive your physical sensitivity, and emotional sensitivity may increase too. Smells, sounds, TV, crowds, and certain people may feel unbearable at times. Breathe, spend time in nature… Take some time to rest nurture yourself and reboot, and know that you will adjust. This sensitivity may also make you intolerant towards certain foods, beverages, and situations, which you could have handled before. Listen to your body… Be gentle with yourself and know that when things fall away from your life, they are making way for higher vibrational situations, activities, foods and surroundings which will resonate, and that will feel so much better to you. If you feel you need to rest… Rest! If you're totally charged up and energized, get some exercise… Stay present in the moment and remember that whatever symptoms appear, they will pass and one of the best things you can do is to stay present, centered, and in a state of love and gratitude right now. When it comes to ascension symptoms… Breathe your way through any challenges… And be sure to check out my post on How to Get Through Ascension Symptoms While Keeping Your Sanity here! There are of course some positive signs of Spiritual Awakening, which you can learn more about here! I feel all these symptoms with no physical cause and just tried the solution of asking my angels for help. Instantly experienced tingling and peace. God is great. Thank you!! Wow, it feels so magical, the constant flow of energy going through my entire body. I feel very light and dizzy, like im gonna float away. I just have to be outdoors, roaming around directionless, by myself but wow this is such a sensational feeling. My new energies feel so, great but yet so foreign, Im welcoming them at every moment, not fighting it is the only way to go. Why do people go through this phase and what is its purpose? Hi Melanie! I am so amazed by this uplifting and informative site! I am having so much fun exploring and have downloaded two mediations onto my phone. I think I am having ascension symptoms but I am not going to question or doubt. I am going to just go with the flow as you say and do some of these suggestions. I have been having insomnia and have become very sensitive to vibrations around me. I look forward to working more on myself and hope to take one of your courses soon. Thanks so much for all your hard work and all that you do! Hi, Melanie, I’m so glad that you want to listen. Apparently, I’ve been ascending my whole life. All my life I’ve known that I was different, that I didn’t fit anywhere. I was born and raised in rural N.C. in the ’60s and ’70s. I was always the highly intelligent and sensitive weird kid who got beat up at school and emotionally abused at home every single day by parents. Teachers didn’t really know what to do with a kid who wasn’t going to be factory fodder. I had no athletic skills so my father rejected me. I married about as badly as I possibly could. I’ve been alone and lonely as long as I can remember. But through it all I knew that I had powers or abilities that nobody would tell me about so i just had to find what they were myself. Like Dorothy in the Wizard of Oz, I’ve spent my life looking at the man behind the curtain, even when the church and society in general told me not to. That’s when I discovered just how little the church wants people to know about how the multiverses really work. Slowly but surely, I’ve been figuring out who and what I REALLY am. marriage I’m in is no good for me but I just can’t seem to be able to walk, out of fear. That’s mainly what I need help with and believe me ask.angels was what I needed, when I needed it. There’s so much material here that eventually I’ll figure it out. I love you so much and I’d love to meet you one day. Very interesting. Good luck to you on your ascension path. Thank goodness for finding people like Melanie to light our way – its no mean feat to have such a responsibility, but obviously she was chosen for this path. good luck and sry for the long post. You’re absolutely right that this is uncharted territory… And also that although the ascension path is challenging at times… Ascension is far more rewarding (and less painful) than trying to stay in the old paradigm that is falling away. Thank you so much for this article! I’ve been having symptoms of pain along with wonderful flows of energy. I’ve also been having headaches and I’m not a headache person. I understand now that I’m picking up on the thoughts of others close to me. Ascension can be a real challenge, depending upon your environment. Your article has helped me tremendously! I can calm down now and relax through the process. Bless you! I forgot to ask If anybody else ever experience this or have any idea what it may mean. I would remember laying in bed as a little boy and in my minds eye, I could see a thread of slow moving light, it seem to barly move and I felt that as in travel in darkness. At times in my life I can feel that light like the way it was before. Thank you so much for this! I was really starting to think I was losing my marbles… I am so much more at peace now, because literally every single one of these has been happening in my life just lately. Thank you so much for sharing this wisdom! Thank you Melanie – this is so helpful. I am really feeling some of these things mentioned. I have had intuitive thoughts that this is the case and it is so nice to be able to have your perspective and confirmation. Thank you!